Recipe from April Armstrong, Assistant Marketing Manager, Customer Marketing, Wal-Mart Team, Kellogg’s. 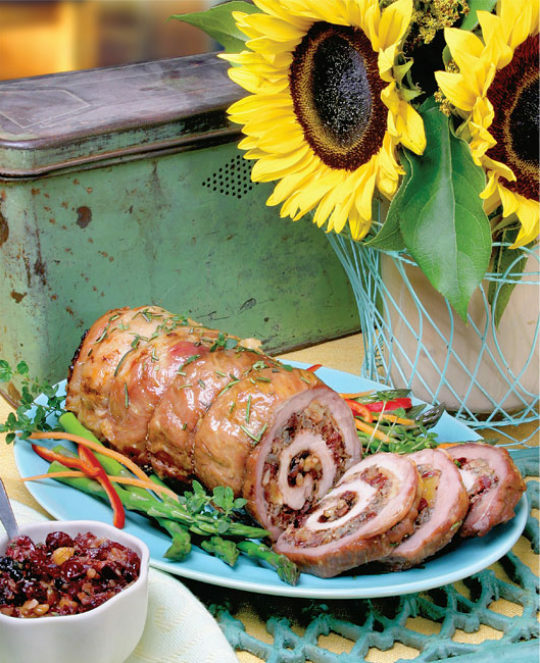 This festive dish is perfect for entertaining or for a holiday treat. Substitute any dried fruit for cherries for a different taste. The end result is a beautiful spiral that makes an appealing presentation. In a small pan, combine water, rice, rosemary and salt. Bring to a boil and reduce heat. Cover and simmer for 40-45 minutes or until rice is tender. Remove from heat. Set aside. Spread the butterflied roast open and cover with plastic wrap. Pound with a meat mallet to 1/2" to 3/4" thickness. Remove the plastic wrap and set the meat aside. In a large skillet, cook onion in olive oil until tender. Stir in parsley, thyme, pepper, nuts and cherries (or other dried fruit). Add wine and cook, stirring until most of liquid is evaporated. Spread sauce over surface of the roast and roll up from the long side. Tie with string. Insert meat thermometer. Roast meat in oven in shallow pan for two hours, until thermometer registers 155. Remove from oven and let stand covered for 15 minutes. Temperature should rise an additional 5 degrees. Remove the string and slice into 10 portions. Serve with warm fruit sauce poured over top. This recipe makes 10 servings, each approximately 5 ounces of meat.